Largy Coastal Self Catering Apartments, Causeway Coastal Route. Located in Carnlough, County Antrim, Northern Ireland. On the beautiful Causeway Coastal Route in Glencloy Glen. Glencloy is the second of the nine Glens of Antrim. 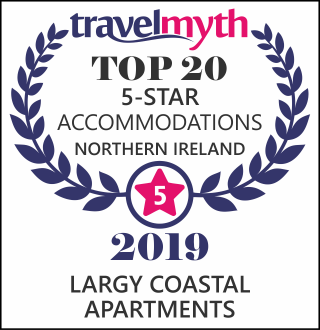 Largy Coastal Self Catering Apartments are situated in Carnlough on the Causeway Coastal Route certainly in a prime location. They are in a beautiful setting and most noteworthy with uninterrupted stunning sea views. Furthermore, these luxury apartments have a five star rating and uniquely have all bedrooms en suite. They are close to Belfast, Titanic Centre, the Gobbins Victorian walkway, Game of Thrones locations and the famous Giants Causeway. Private car parking is available for all apartments. The four self catering holiday apartments are all in one block while each has a separate entrance. Glenariff apartment has disabled category one access. Largy Coastal Self Catering Apartments on the Causeway Coastal Route are fully furnished with free wifi access, freeview TVs. Each apartment has a fully equipped kitchens with all modern facilities. 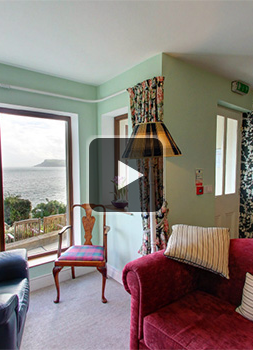 The apartments are set in one acre of garden and woodland over looking Carnlough Bay. Furthermore they have stunning panoramic views over the Irish Sea to Scotland. A deck area is provided with quality garden furniture to relax and enjoy the uninterrupted views of the sea and headlands. A log cabin is provided with high powered binoculars hence twitchers are able to observe the local bird life. Those who enjoy observing wild life will, on occasions, see schools of dolphins as they pass along the Antrim coast. Furthermore, we are pleased to announce the installation of a luxury outdoor Hot Tub, situated next to the log cabin. We provide quality towelling bathrobes and towels to add to the luxury. Whilst luxuriating in the Spa you will be able to take in the breathtaking sea view of Carnlough Bay. You can book a boat trip around Carnlough Bay on an old refurbished lifeboat the ‘Curiosity’. Also, explore Straidkelly Nature Reserve which is within a short walking distance. In the Nature Reserve you will see the endangered native Red Squirels, butterflies and wild flower meadow. In addition, fly fishing permits are available for fishing the 9 lakes which are on the Antrim Plateau. Largy Coastal Self Catering Apartments are on the Causeway Coastal Route. The Causeway Coastal Route is the ideal holiday location with good road links to UK international airport, George Best Airport and ferry ports in Larne and Belfast. Book now for an unforgettable holiday, see our Latest News for special offers.